Here is something to help you find murals. 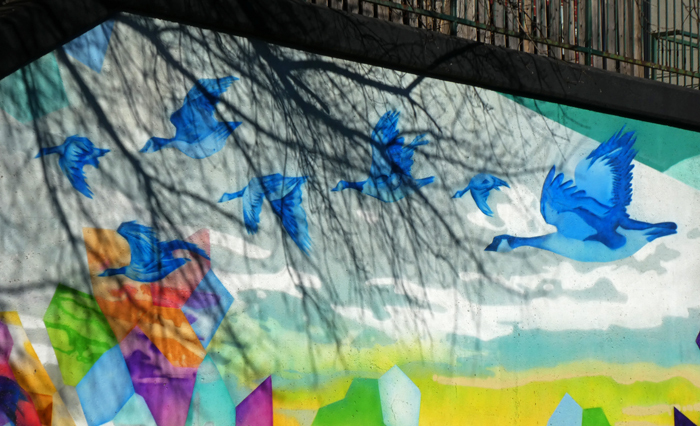 Hello, beautiful mural, the blue geese are lovely. Enjoy your day, have a happy week ahead. This is a fine looking mural. Good find. If those geese were real, you would be able to hear them flying by. I know because the ones that fly by my place from time to time make a lot of noise. Beautiful mural and beautiful colours. Wonderful movement in this mural and I like the bright colors. ...I see a lot of geese flying around these days! Beautiful, love the bright colors, Pat ! Me encanta ver siempre tus murales Pat. The blue geese are much nicer than the live and pooping Canada geese I see up in New England. The geese are back in town!